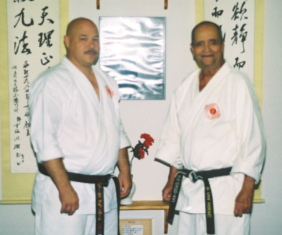 Our beloved teacher, Sensei Davenport passed on October 11, 2013, while pursuing his passion of Karate in Naha, Okinawa. After his death, his long time student Michael Hines stepped in and continued to run the dojo in his absence. He is a San-Dan in Chito-Ryu Karate, and has trained continually since 2000. He has trained with numerous high ranking traditional Karateka during both his time with Sensei Davenport, and since his passing. Sensei Hines and the other students hope to continue the tradition of excellence set by Sensei Davenport at the Kentucky Budo-Kan. Rather than rewrite history, Sensei Davenport's words have been copied below in full from his old site. "The Kentucky Budo-kan, originally the Frankfort Yoseikan dojo is located in the city of Frankfort, the capital city of Kentucky. The club is presently run by James L. Davenport, 8th Dan, Hanshi . The school was established in 1966, by George VanHorne Jr., Hanshi and has always run continuous classes since it was first established. We are the oldest karate school in Frankfort and one of the oldest schools in the state of Kentucky. The Kentucky Budo-kan is affiliated with the Koshin-ha Chito-ryu Karate-do Organization. The founder of the Frankfort Yoseikan, Sensei George VanHorne, Jr. began his karate training in 1961 in Jersey City, New Jersey. The style he practiced was an Okinawan style of karate known as Isshin-ryu. His first karate teacher was Sensei Don Nagel. Sensei VanHorne would eventually accept a job as a college professor at Union College in Barbourville, Kentucky. Having acquired the rank of Sho-dan in Isshin-ryu karate in 1962, he would later run an Isshin-ryu karate club while teaching at Union College. In 1964 he moved to Covington, Kentucky and shortly thereafter, began training with, another karate teacher, Sensei William J. Dometrich. Sensei Dometrich was one of only a handful of young men who upon returning from military service in South East Asia were responsible for introducing the various styles of karate into the United States. While training with Dometrich Sensei, Mr. VanHorne would return to New Jersey once more to test for, and be promoted to, the rank of Ni-dan under Sensei Nagel. Living in Kentucky and continually training with Dometrich Sensei, Mr. VanHorne would soon be accepted into the US Chito-kai at the rank of Ni-dan by Dometrich Sensei. In 1966 Sensei VanHorne accepted a job as Professor of History at Kentucky State University which demanded that he relocate to Frankfort, Kentucky. Wasting no time, that same year he would established the Frankfort Yoseikan dojo. The 1966 classes were originally held in the driveway and basement of Sensei Van Horne's parents home. Shortly there after, classes were moved to a dance studio on the Kentucky State University campus. In 1970 classes would be moved to the new Frankfort, YMCA. In 1975 a small building was rented on Broadway Street and although the classes at the YMCA continued, this building would serve as the dojo for two years. In 1977, the Broadway property was sold and all classes were again moved to the Frankfort, YMCA. where the club still trains to this day. In 1984 Sensei Van Horne would re-marry and move back to the Northern Kentucky area and although he had continued to train with Dometrich Sensei by constantly commuting the 200 mile round trip to Covington, he would once again find himself training on Dometrich Sensei's Hombu dojo. Although Sensei Van Horne hated to leave the club he had worked so hard to establish over the years, he knew that the club would be in good hands. The classes at the Frankfort Yoseikan would be turned over to his number one student, Mr. James Davenport, known to his fellow students as Jim. Mr. Davenport had been a loyal student of Sensei Van Horne's from the day he first donned a karate gi in 1970, many times being the only student of Sensei Van Horne's for months at a time. Sensei Davenport remembers those times as good times for him, but possibly not so good for his teacher. "I knew at times I was the only student to attend classes and sometimes this would last for months at a time. Then I would be joined by other students, but they would soon leave. Every aspect of training under Sensei Van Horne was extremely, physically hard, but being in good shape due to my early age and my father's insistence that I compete in track and field, I was able to hang in there. Even at this early age, I understood that having only one student must have been somewhat depressing for a man such as Sensei Van Horne, a man who had dedicated his life to teaching others and because of this fact, I was determined to work harder than ever. I wanted my Sensei to be proud of me." Sensei Van Horne had trained two men in Frankfort to the rank of Sho-dan; Mr. Edward Logan who no longer trains, but now runs a very successful law firm in Frankfort and Mr. Willie Elliott who now continues his training at the Hombu dojo in Covington, Kentucky. Once Sensei Van Horne had accepted Mr. Davenport as a student, it would not take long before he would take this young man under his personal guidance. He wanted to train the young student, but he wanted to train more than his body, he wanted to train his mind. Mr. Logan recounts one of Mr. Davenport's early classes. "Jim had been in class for about six months when I was standing observing a class one night with Sensei VanHorne. Sensei Van Horne turned to me and said 'Jim is going to be special, he's different, he is going to stay. Someday I know he will reach black belt.' I was not sure what to make of this, Sensei Van Horne had never said this about any other student we had and we constantly had students coming and going during this time due to the severity of the classes. However, somehow he knew Jim was going to be different and he was right." Once Mr. Davenport had been in class for a short period of time Sensei Van Horne prepared to train his young student's mind. He would begin this process by giving Jim a book to read. Mr. Davenport recounts the first few books he was given to read. "I was given a book about a samurai and his young apprentice and naturally I put my teacher in the place of the samurai and myself in the place of the young student. The story told of how the samurai was extremely hard on the student, but that the student did whatever he was told to do and did not complain even a little bit. At first the student was afraid of his teacher, but eventually that fear would be replaced with respect. I remember having a very difficult time reading that first book as I was a very poor reader at the time and had avoided reading anything I did not have to read while in school. With a dictionary sitting beside me, it seemed to take me forever to read that first book and I felt good when I had finished it. However, the next class when I returned the book to my Sensei, he immediately gave me another book to read. At the time I was frustrated and did not understand why my teacher would give these books to me to read. All I knew was that my teacher had given me a task and he had commented many times in class about developing the mind as well as the body. I had no idea just how profound an effect reading these first few books would have on my entire life. For the first time in my life, I actually began to enjoy reading and I started reading any book I could find on the martial arts. After a few months of training with Sensei Van Horne, I would be invited to travel to the Hombu dojo and meet the head of the US Chito-kai. At the time of this first trip, I had no idea just how influential this first trip and the introduction to Dometrich Sensei would be on my life in the future. I remember my first trip to the Hombu as both exciting and a very scary experience. Meeting Sensei Dometrich for the first time was a unique experience to say the least. I remember meeting him and immediately having the feeling that it was meant for me to make contact with this man. Sometimes in life we just have the feeling that what we are doing is natural or even planned to happen. To me, meeting Dometrich Sensei and his wife Barbara, who is known as Okusan to the students, was one of those experiences. I felt as if I had known them all of my life. I would later find out just how much Dometrich Sensei and I had in common. Dometrich Sensei was from the mountains of West Virginia, I was from the mountains of Tennessee. He was a police officer and I have been raised to respect the law as well as those who enforced it. I had also wanted to be a police officer from the time I could remember so therefore, I had the greatest admiration for police officers. Dometrich Sensei had served in the US Army's 101st Airborne Division and I had been raised in a military environment due to my father serving in the US Army's 82nd Airborne Division at Fort Bragg, North Carolina when I was born. Dometrich Sensei, through his karate training, was a very physical person. I had been involved in physical fitness through the direction of my father from the time I could remember. Dometrich Sensei was a Buddhist Priest while my father was a Baptist minister. Dometrich Sensei believed in strict discipline and I had been raised in a strict home environment with swift punitive consequences for any infraction of the rules as set down by my mother and father. I knew after my first class with Sensei Dometrich that I would find myself returning many times to train with this man. As the years went by I would find myself traveling more and more to the Hombu dojo to train with Dometrich Sensei. I remember many times in his classes when it seemed to me that I saw the ceiling of the dojo more than the walls. When I make this statement to new students they often ask how this could be possible and I recount for them the many, many times that I was swept totally off of my feet by Dometrich Sensei just after hearing the words, "Weak Stance!" It seemed no matter how good my stance was (at least in my own mind), he would sweep me with the ease of sweeping a child off of his feet. It took many years before I realized that what was being swept away was not only my feet, but my ego as well and although he has never mentioned this to this day, I have no doubt that he knew I was young, strong, fast and like most any other male at this early age, a little to sure of myself. Dometrich Sensei was, without actually telling me, giving me a constant attitude adjustment and for this I have, in my own mind, thanked him many times over. Even thought both of my instructor's (Hanshi Dometrich & Kyoshi Van Horne) technique were extremely fast and powerful, I think it is important to know that even though they kicked, punched and swept me many, many times, they never, ever actually hurt me physically. I now know that this fact was a result of their intense timing and superb control. Today after 34 years of training in Chito-ryu karate, Sensei Davenport now run his own karate dojo and having recently separated from the US Chito-kai has been instrumental in the formation of a new Chito-ryu karate organization, the Koshin-ha Chito-kai. Sensei Davenport also regularly teaches self protection and defensive tactics classes to police departments, correctional institutions, US military as well as the general public. Over the last 30 years, Sensei Davenport took time out of his busy schedule to travel on a regular bases and train with Dometrich Sensei. "Many times over the years I have heard students complain about having to travel a few minutes to train at different locations and how it is too far and takes too much time. Although the 200 mile trip to train with Dometrich, Sensei was an all day affair for me and the students of mine who many times made this trip with me on a regular bases, I can proudly say that I have logged thousands of miles over the past 30 years and I have made more trips to train with Dometrich Sensei than any other student or instructor in his organization outside of his Hombu dojo."